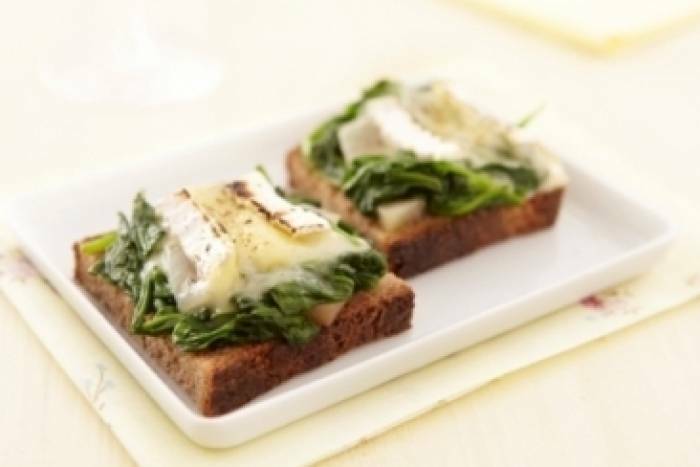 Spinach and pear on a piece of country bread topped with a slice of melted brie. Peel the pears, remove the core and cut them into thin strips. Melt the butter in a frying pan, add the pear to the pan and cook until golden brown on all sides. Wash and dry the spinach then blanch the leaves in boiling, salted water for 30 seconds. Refresh the spinach in iced water and then drain and pat dry on paper towels. Toast the bread until golden brown on both sides. Mix the pears with the spinach leaves and then arrange them on the toasted bread. Top with slices of brie and season with salt and pepper. Place back under the grill and allow the cheese to melt. Serve immediately.